When talking of quality boots, you might have heard of Uggs and Emus. Both these brands come in high quality and are widely preferred. Even though both the Uggs and Emus come in great style and comfort, they have some specific difference between them. When Uggs can be called as the original brand, the Emus are classified as the generic brand. One of the main differences that people have noticed between the Ugg boots and Emu boots is with regard to their price and quality. When comparing the price, the Ugg boots are priced higher than the Emu boots. 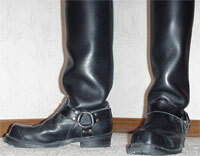 Though both the boot brands come in high quality, the Emus are most preferred for their quality. In every aspect of the design and making of the boots, the Uggs and Emus are different. In stitching, the Ugg boots come with a single interlocking stitch. On the other hand the Emu boots have double interlocking. When the Uggs boots are flat, the Emu boot provides an arch support. Though both the Emu boots and the Ugg boots provide good soles at the toe and heel parts that wear outÂ faster, they have differences. While the Emus come with a double layer of EVA, the Uggs soles come with a single layer of EVA. This means that the Emu boots last more than the Ugg boots. While the wool used in Emu boots comes from the sheep in Australia, the wool used in Ugg boots comes from sheep seen in other parts of the globe, especially Mongolia. Another difference that can be noticed in the wool is that the Emu boots are manufactured from sheep that graze in the plains. On the contrary, the wool of sheep that are seen in the mountains is used in the manufacture of Uggs. 1.When Uggs can be called as the original brand, the Emus are classified as the generic brand. 2.The Ugg boots are priced higher than the Emus. 3.When the Ugg boots come with a single interlocking stitch, the Emus boots have double interlocking. 4.The Emu boots last longer than the Ugg boots as the former is made of double EVA layers. On the contrary, the Ugg soles are made of a single layer of EVA. 5. When the Uggs boots are flat, the Emu boot provides an arch support. 6.Though both the brands are of good quality, the Emus are widely preferred. Prabhat S. "Difference Between Uggs and Emus." DifferenceBetween.net. December 8, 2009 < http://www.differencebetween.net/object/difference-between-uggs-and-emus/ >. Maybe you could make changes to the post subject title Difference Between Uggs and Emus | Difference Between | Uggs vs Emus to something more better for your webpage you make. I enjoyed the blog post nevertheless.